What Crystal Globe symbolizes and how to place this object? Earth energy in globes are important to generate wealth and abundance. Crystal globes are made from glass with lead oxide to ensure potency for Feng Shui use. A simple way to recharge the earth energy in a crystal globe is to shine lights on it. Light represent fire element and fire generates earth energy in the crystal globe. On the other hand, Money Frog (also called Three Legged Toad or Frog or "Chan Chu") is the most significant symbol of prosperity in Feng Shui. It is linked to the moon and associated with monetary gain, wealth and good health. Chinese legends had said Money Frog was the wife of one of the the Eight Immortals. She was being punished for stealing the peach from the heaven. Naturally greedy, she craves for money and wherever people see a Three Legged Frog, there is a bed of money surrounding it. For generations since ancient China, this mythical Money Frog is one of the chinese holy creatures that protects us against misfortune and brings to our household bigger enrichment in wealth. We're talking about creating abundance in wealth for serious Feng Shui practitioners. 1. For businessmen who wanted success in gaining business from many nations of the world, the crystal globe with Money Frogs is a must to be placed at cash registrars, shop reception, treasurer's desk and safe and any part of business premise which deals with money and customers. 2. 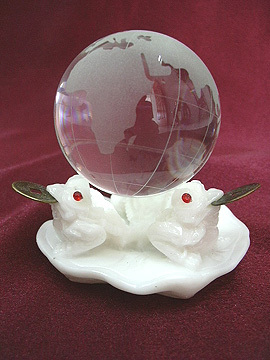 The crystal globe with Money Frogs is also suitable to enhance the southeast (known as wealth sectors), in your personal "Sheng Chi" direction (click here to find out) and in the locations of your premise where lucky stars #8 and #9 reside. In these locations, you will experience sudden wind fall from time to time after placing this enhancer. 3. Place anywhere in bedrooms or study desk to enhance literary pursuits for children and examination luck. Similarly, it can also be placed in northeast sector to tap literary luck energy according to 8-Aspiration Theory. It would also help your children win scholarship and gain important places in universities. Northeast is also a sector for earth element. Therefore crystal globes are suitable here. 4. For writers, reporters, journalist and administrators, the crystal globe will enhance fame and recognition. Place it in the south sector to tap the fame energy. 5. For businessmen, it is a must to obtain such globes to ensure global network and enhance sales to be a global one. Place it in the south, southeast and northwest. 6. To gain support from important people and helpful people into your career, literary pursuit and business, be sure to have this item in the northwest.